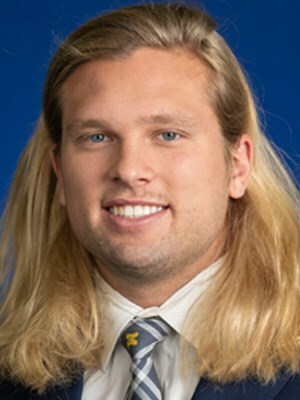 Chase Winovich is a kid that doesn’t give up and it shows each game. He is relentless in his pursuit for the quarterback or ball carrier. He has the power to bull rush if need be, uses his hands to gain seperation for a swim move or to dip on the inside of tackle to force the quarterback outside of the pocket or put himself in position for the sack. Winovich is able to set the edge and disengage from blocks to make the stop. He is fast enough and takes the correct angles to prevent the ball carrier to hit the outside. He shows the awareness of seeing a play develop. Whether it is realizing he is too far up field and spinning back inside to the quarterback or running back. He also showed the ability to recognize a screen mid rush and back off to stop it quickly or saw a running back slipping behind him in the flat and left the rush to prevent extra yardage. It is those types of plays and awareness that will show at the next level. Winovich pops on film and has been one of my favorite players to watch so far!